English is a constantly evolving language. New words are constantly being added to the lexicon whilst the spelling and meaning of existing words can evolve and change. Even the alphabet is not immutable. For example did you know that not so long ago there were 27 letters on the alphabet. Today the humble ampersand (the ‘&’ character) is used primarily in business names. However that small character was once the 27th part of the alphabet. Where did it come from though? In fact the the origin of its name is almost as bizarre as the name itself. The shape of the character (&) predates the word ampersand by more than 1,500 years. In the first century, Roman scribes wrote in cursive, so when they wrote the Latin word et which means “and” they linked the e and t. Over time the combined letters came to signify the word “and” in English as well. Certain versions of the ampersand, like that in the font Caslon, clearly reveal the origin of the shape. The word “ampersand” came many years later when “&” was actually part of the English alphabet. In the early 1800s, school children reciting their ABCs concluded the alphabet with the ‘&’. It would have been confusing to say “X, Y, Z, and.” Rather, the students said, “and per se and.” “Per se” means “by itself,” so the students were essentially saying, “X, Y, Z, and by itself and.” Over time, “and per se and” was slurred together into the word we use today: ampersand. The ampersand is also used in an unusual configuration where it appears as “&c” and means etc. 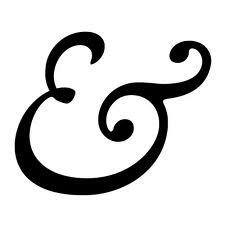 The ampersand does double work as the e and t.
The ampersand isn’t the only former member of the alphabet. Two others aer the thorn and the wynn. Before exploring these 2 lost characters let’s explain a bit about Old English. English was first written in the Anglo-Saxon futhorc runic alphabet, also known as Anglo-Saxon. The Angles and Saxons came from Germany and settled in Britain in the fifth century. The region they inhabited became known as “Angle-land,” or “England.” Eventually, Christian missionaries introduced the Latin alphabet, which ultimately replaced Anglo-Saxon. But for some time, the alphabet included the letters of the Latin alphabet, some symbols (like the ampersand), and some letters of Old English. As Modern English evolved, the Old English letters were dropped or replaced. It’s also interseting to note that the letters “u” and “j” didn’t join what we know as the alphabet until the sixteenth century.